Myself, and two other friends have been attempting to play this over netplay, and regardless of the revision of Dolphin we've tried (we've tried 5) the game, one way or another, is incapable of saving. We will finish a level, and go to save our characters, and on most revisions, the game will lock up during saving. One of the newer revisions, it pretended to save the game, and did not lock up. But upon loading our characters, we found it was the save file previous to the most recent save. Does anyone have any idea how to get this game to save properly? You probably didn't checkmark "write memcard" option in the netplay window. Try that. DC-Netplay Branch does not support memcard writing in this game, which is probably what you ran into. Regular dolphin builds should work. I appreciate the quick response, we will definitely try that today on a newer build. Whenever we used a non-netplay branch version however, when we unchecked Dual Core, I noticed a pretty big FPS drop online. And the audio began being choppy, anything you know of that would help with that? It's correct emulation for the audio to slowdown/be choppy when the game slows down. Since the DC-Netplay branch isn't being worked on, there's nothing that can be done at this time. Sorry if i worded it weird >_< I meant when we are using a non-netplay branch revision of Dolphin, we are experiencing audio choppyness/frame loss. On the Netplay Branch version we ran a constant 60 frames and clear audio, on a Normal Revision, we can drop to as low as 20 frames and have choppy audio. Not sure if i'm just setting it up wrong or what..
Could you post your settings for me? I'll gladly help you out; I've wanted to test this game for a while and this seems like a good opportunity even though I don't own it. 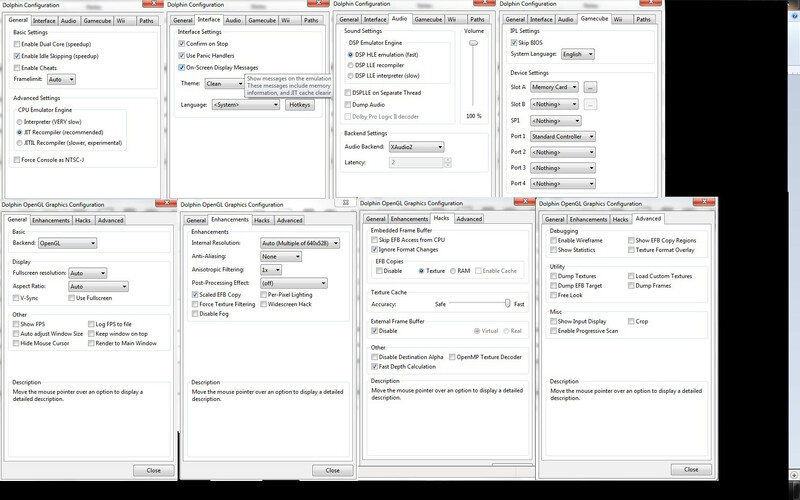 Heres a link to a screencap of all my settings. You could try using Netplay in 4.0.2 and see if it's faster there; nothing really looks wrong with your settings. It seems 4.0.2 is actually running the game slightly slower than 4.0-1569 that we're using currently. If we just have to deal with the frame loss and audio issues, we can. Its inconvenient, but it doesn't make the game unplayable by any means. It's just a shame we cant keep dual core on.